IndonesiaTravelVisit.com | Waiting for the sunset to come above the lines of pine trees, within the green mountains of Menoreh, while watching the lake from afar. The fresh air and tranquil place are the relief for stress. The Menoreh Maountains had been very friendly at that particular afternoon; it greeted us with cool fresh air to refreshen us after going in an exhausting one-hour trip all the way from Jogja. Our feelings, which had been tired of being hurried up by the crowded city traffic, were instantly brought to tranquility. No motorcycles passing by, quiet roads, green shady yards in front of the local houses-all just tempted us to move here. The place threw our memories to our young days, to the home where our memories were kept safe. We were in Kalibiru, a village in Menoreh, the mountains that bordered the West end of Yogyakarta. In these very mountains, 200 years ago, Prince Diponegoro and his troops once fought against the Dutch, before he eventually been deceived and exiled to Sulawesi, where he spent the rest of his days until he died there. 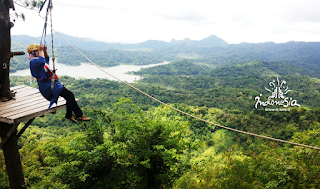 Kalibiru is now a village known mostly for its ecotourism. This is, indeed, not the sort of thing that happens just the way it is; it took decades to recover its beauty-the land had once been dull due to deforestation. Presently, thanks to the locals' efforts in reforesting the village, Kalibiru tourism has mobilized the economy and indeed has become their livelihood. That's how it goes between the nature and manbeing-they take care of each other. The perfect time to pay a visit to Kalibiru would be during the afternoon, when the sun shows more friendliness and put more melancholy to the surrounding atmosphere. Around the area, there is a pine tree growing just at the edge of a cliff. 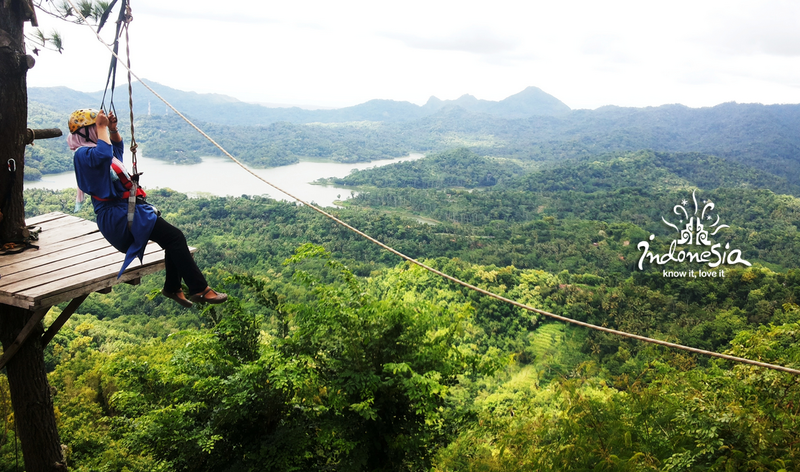 This is the exact spot from where we can freely enjoy the charming view of the mountains of Menoreh. 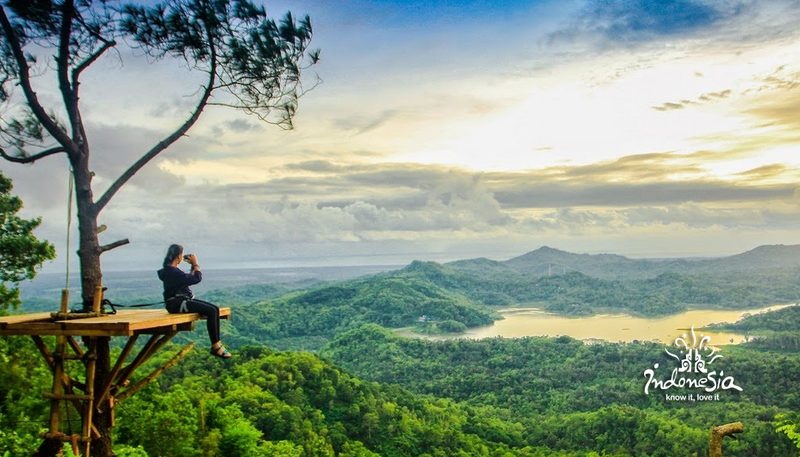 So, don't feel reluctant to climb the provided hung stairs; sit on the wooden board installed there, inhale the fresh mountain air and exhale slowly while closing your eyes. Feel every second passing as you will feel that time passes so slowly. For a while, forget the city live, leave behind all thoughts about your piles of works, and just savor the view you've got in front of you. From the wooden board, you can see the sun riding on clouds, heading to its home. The ray of lights reaches to the surface of the Earth that slowly turns to a shade of golden color; as if the sun is leaving golden traces with each step it takes. A tranquil lake is also visible from afar. The lake has been the mirror for the face of the sun, reflecting glimmering rays along the day. 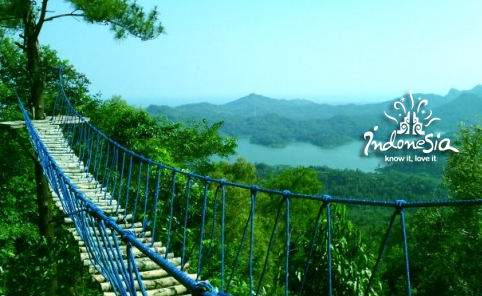 In Kalibiru, all troubles will disappear into the tranquility. As for us, it's time for us to go back home with peace as evening has finally come. 0 Komentar untuk "KALIBIRU , Enjoying the Emotional Mountains of Menoreh"